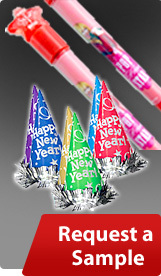 Celebrate Line is a core manufacturer of party hats, stickers, and blowouts. Celebrate Line was created as a single-source for wholesalers, ad agencies, and other distributors to find unique products at competitive pricing. Celebrate Line sources products domestically and internationally to assure the best combination of uniqueness and cost competitiveness. Our U.S.-based staff will be happy to assist you in finding the perfect item for your promotion or party.